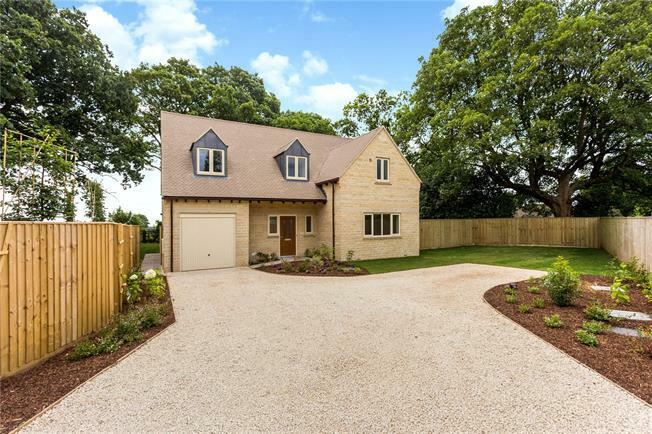 Tucked away off the village road behind a neighbouring dwelling, lies this brand new detached house with integral garage currently being constructed by a local reputable firm, Partridge Homes (Cotswold) Ltd. Built from Foticrete Shearstone (Cotswold village range) under a Cotswold plain tile this property enjoys views across open farmland to the rear. Originally this site was an orchard therefore the grounds already benefit from some mature planting. The welcoming entrance hall with cloakroom leads separately into the sitting room and kitchen/dining/family room. The sitting room will have a natural stone fireplace with a gas fire. The fitted kitchen/dining/family room with sliding patio doors to rear garden (and access to the utility) will be fitted out with Neff appliances. Under floor heating on the ground floor with limestone tiles in the kitchen/dining/family room, utility & cloakroom. Upstairs the master bedroom enjoys far reaching views through the trees towards open farmland & boasts a ensuite shower room, there are two further bedrooms & a fourth bedroom which could be utilised as a study. Family Bathroom. Oak doors will be fitted throughout & there will be gas central heating & a septic tank. 'Quercus' - Latin for oak. Please ask for the specification list. As detailed on drawing. Garage 16ft 11ins x 9ft.